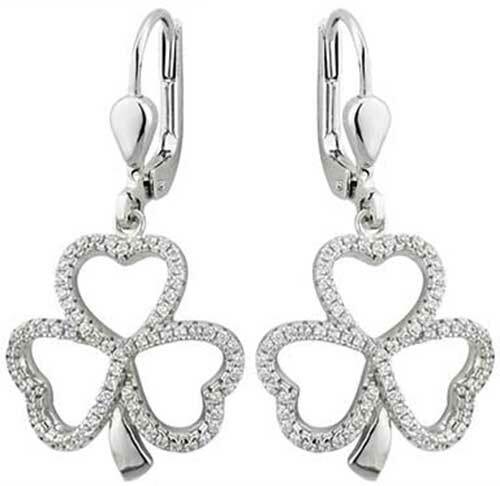 Shamrock earrings feature sterling silver construction with borders studded with CZ stones. These sterling silver shamrock earrings have been hall marked by the Irish Assay Office at Dublin Castle. These sterling silver shamrock earrings feature an border of CZ stones. The drop shamrock earrings are on latching Eurowires and measure 5/8“ wide x 1 1/4” tall, from the bottom of the stem to the top of the wire. These Irish earrings are made by Solvar Jewelry in Dublin, Ireland and are gift boxed with a shamrock history card, complements of The Irish Gift House. 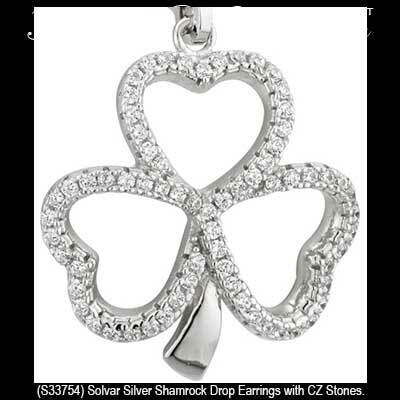 These shamrock earrings are part of the Fáilte Collection from Solvar Jewelry.